When examining changes in mCPR over time, it is helpful to look at the annual growth rate, which quantifies how fast countries are expanding their family planning programs. Average growth rates calculated for 2012 and 2013 are displayed in Figure 4.5. These values were calculated using data from the last two available surveys (DHS, MICS and/or PMA2020) in each country and depict annual growth rates in 2012 and in 2013, not growth between those two years. 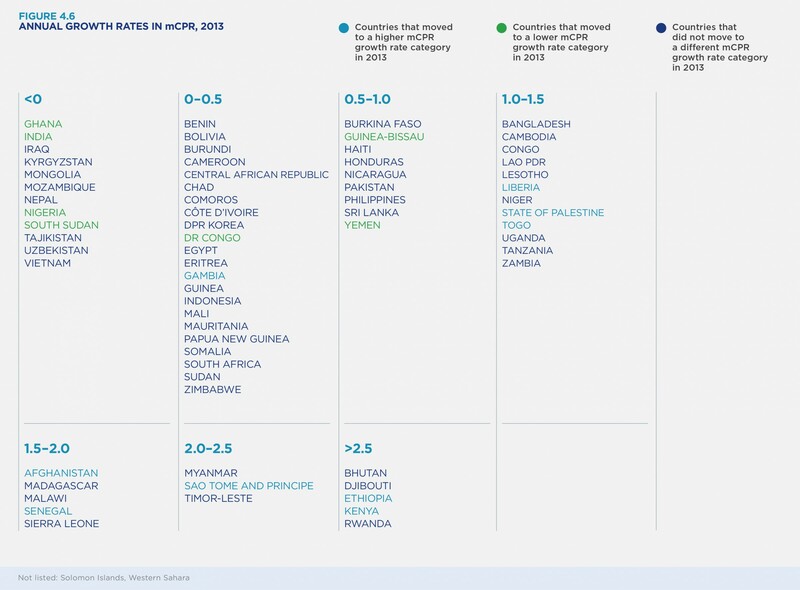 The differences between the values for 2012 and the values for 2013 are due to new survey data being released since the last FP2020 report, which shows some countries growing faster than previously assumed, and some growing slower. The overall average growth in mCPR across FP2020 countries is estimated to be slightly slower than previously estimated. The average mCPR growth rate (0.65% annually) masks some important shifts, such as countries where the growth trajectory is rising. In five countries—Bhutan, Djibouti, Ethiopia, Kenya and Rwanda—annual growth rates exceeded 2.5%. Assessment of regional patterns indicates relative stagnation in Central Asia, the Caribbean and Central and South America. The list of countries with annual changes in mCPR of 2% or greater in 2013 is dominated by sub-Saharan African countries. Of particular note is that mCPR growth in francophone West Africa now averages about 1% per year for almost all countries, which is in marked contrast to earlier, lower growth. Focusing on average growth rates can mask important changes in countries’ movements between the different categories of growth. Individual countries show movement in a positive direction. Fewer countries were in the lower growth rate categories (less than 1): 43 in 2013 versus 47 in 2012. More countries entered a higher growth trajectory category (greater than 1): 25 in 2013 versus 21 in 2012 (see Figure 4.6). To be on track to achieve the FP2020 goal, many more countries will need to move into the higher growth categories. 58. The narrative reflects non-rounded values for mCPR. 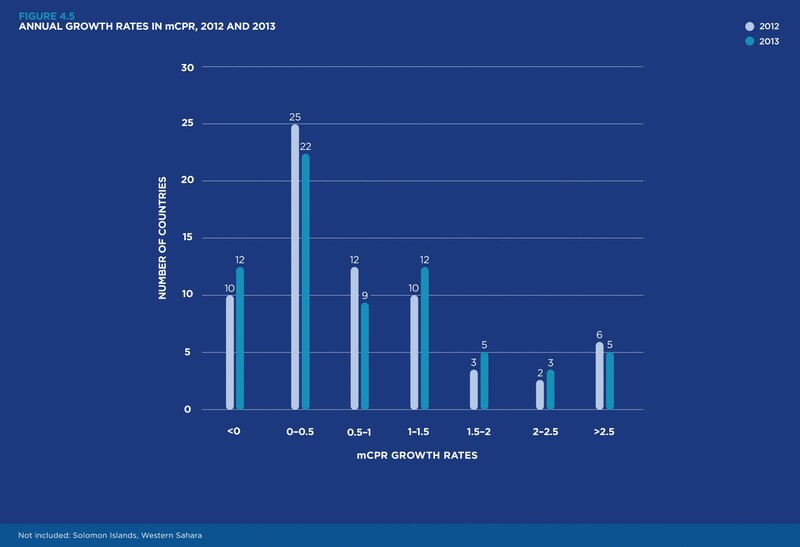 Since the previous FP2020 progress report, 14 countries have newly released survey data that were used to estimate mCPR growth rates.